We were contacted by African Pastors Fellowship as they wished to generate awareness in the UK Christian audience of their work and specifically their ‘eVitabu’ project; increasing brand awareness, prayer support, newsletter sign ups and donations. African Pastors Fellowship works alongside church and community leaders in East Africa, training, equipping and resourcing to see communities transformed. 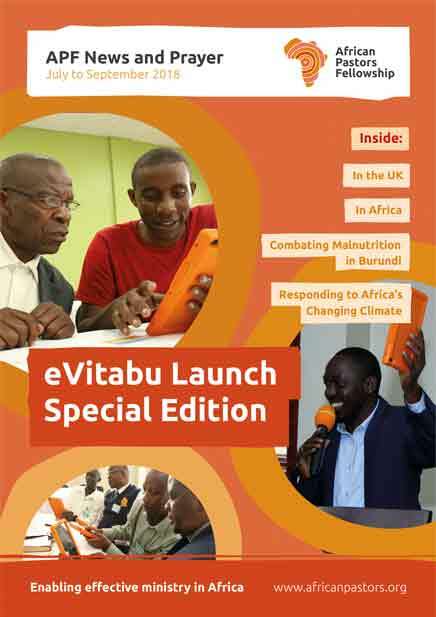 Their innovative ‘eVitabu’ app, which is installed on solar-powered Android devices will help support pastors’ ministries with large church networks across East Africa, potentially impacting the Christian journey of over half a million people. We developed a PR strategy and approach, targeting key UK Christian media titles. We secured coverage in Christian and secular media including Premier Radio, The Baptist Times, Charity Digital News, Keep the Faith and the Canterbury Journal. Coverage included prominent articles and a radio interview with APF’s CEO. We also generated social media activity with relevant audiences.